In the world of Avian there is an order known as Falconiformes; they are birds of prey, hunters of meat. Within this order is a family called the Cathartidae or Vultures and of the Vultures there is a species called Sarcoramphis papa, loosely translated this means “father of the coffin”. He is indisputably “The King of Vultures”. In the whole of Belize four species of vulture can be found. They are the Black Vulture, Turkey Vulture, Savanna Vulture, and this week’s bird of the week, The King Vulture. Having seen the first three, Bubba and I set out to find The King. 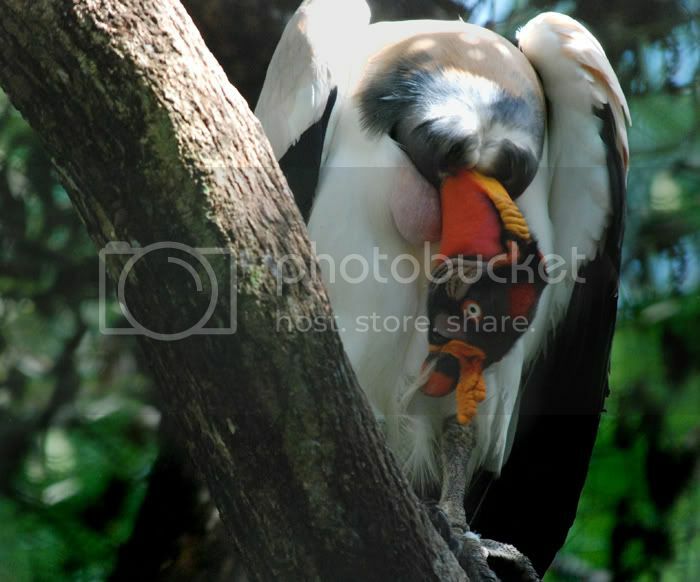 Steve Howell’s “The Birds of Mexico and Northern Central America” says the King Vulture is rare and decreasing in numbers. Our first stop was in Orange Walk to ask the famous Belizean bird watching tour guides, The Novelo Brothers, where we might begin looking. We found them at their usual pub in the town square, Bubba enticed Gilberto with a few cold beers to talk to us about the King. He said that the King was called the King because all the other vultures could not eat from fresh carrion until the King had come down and helped himself to the eye balls of the dead. He then warned us that if we got too close The King would vomit blood and guts on us. Bubba looked at me as if he thought Gilberto might have been reading too many Ann Rice novels and we headed west towards Gallon jug village to see what “Stormin’ Norman” might have to say on the subject, Norman is a special and awesome force in the world of Birders, Bubba felt his unique talents might help us in our efforts to locate the king. After quite a few hours on dusty roads, the cool rain forest around The Looters Trench Bar where Norman resides was refreshing. Almost as much so as the cold mugs of Belican Norman served us. I explained our quest to him and he offered to shoot one of Barry’s cows to assist in attracting a King, ......we declined. Feeling defeated on the way back down the jungle road, Bubba pulled out one of his many bird books, this one titled “Birds, Their Life-Their Ways-Their World”, by Readers Digest. In it, under the topic New World Vultures, he began to read me the most amazing thing. 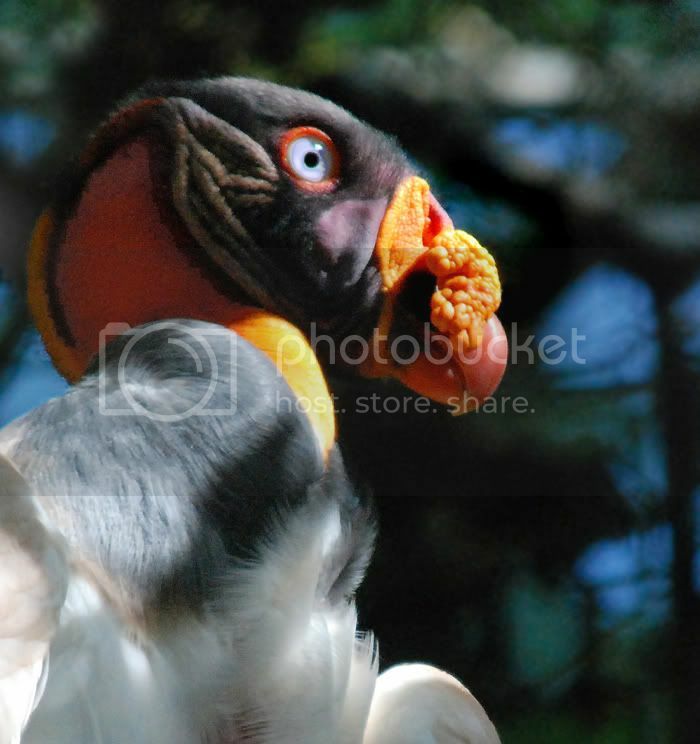 He read, “The King Vulture’s head is elaborately patterned with black, hair-like feathers. The bills are always hooked and may be thick or slender. The legs are medium to short in length, with long toes and poorly hooked claws which are too weak for grasping. Archaeological records shows that certain species of this family were important to some ancient cults. The Mayan civilization of Belize, for instance, was much concerned with animals, and used the King Vulture Sarcoramphus papa as the hieroglyph for Cib, the thirteenth day of the month, often accompanied by a rain sign. It also appears in inscriptions, relating to anthropomorphic gods. The bills and feet are relatively weak and not strong enough to rip open a recently killed animal. They will, therefore, sit and wait for the skin to rot before attempting to eat. In the meantime, the eyes are usually plucked out, and appear to be one of the delicacies. When the corpse is “ready” the stomach wall is punctured and the intestines are eaten immediately. After such a gruesome feast individuals can be so gorged with meat that, on being disturbed, they regurgitate their meal before they can take flight. “...Jumpin Jahosafat Bubba! Gilberto was right,” I exclaimed. Bubba continued to read how under certain conditions they will attack and kill young animals including domesticated stock. Species living in densely wooded areas are known to eat fruit and other vegetable matter when meat is scarce. As he read I noticed Black and turkey vultures circling an area at the side of the road ahead. We stopped to investigate. On the ground lay the carcass of an Oscillated Turkey and as timely as a script, sitting in a dead tree 20 feet above was the magnificent large white Raptor wiping his red bill on the trunk. His flaming orange neck rippled in a swallowing motion . His black pin dot pupil looking down at us was circled in pale blue with a deep orange orbital ring. His multicolored head seemed psychedelic with iridescent blues and yellows, and had what seemed to be black short hair around a bald spot of red skin on top. Just at the base of his neck, where you might expect his chest to be, was a bulging featherless distended crop. Bubba stepped back and said, “Remember Gilberto’s warning!” I wanted to see if the carcass still had eyes, but now believed Gilberto to be gospel. я его видела в Риме! It was a good day yesterday , lots of lucky shots. Wow, I never seen a bird like that! I saw one eating a horse last year. It was pretty interesting how the other vultures just watched him eat alone. We do not have those in Georgia, LOL! The story is from a book I wrote years ago. One of those 'close as possible to truth' and still be interesting things. Yes , and I wonder what purpose it serves, I've read vultures have no feathers on the head and neck because sticking head in rotting body, with feathers gives disease. color doesn't seem to have any bearing. It stands about 4' with wings spread of 6 to 7'. Not for all. Just for author. Re: Not for all. Just for author. something isn't working right when i try and view your page the images are bigger than the screen and i can't scroll over to see all of it. ? is that just my problem or is it that way for all the viewers? What a fabulous journal you have! I noticed you added me and I'm adding you back, although mine's not even half as interesting. I'm envious of your adventures. Very nice to meet you! And nice to meet you . Its a different world of birds 'down under' isn't it. what I'm up to is really learning. I write and enjoy birds . I've found lots of friends provide lots of opinions and lots of windows to see into other worlds . Its highly educational. offering to share my Birds seems to be a non threating thing that every one enjoys. Dogs of War was filmed in my country even though its depicted as Africa in the film. The Birdwatcher is Christopher Walken.